Meat Loaf will release his album Braver Than We Are on September 16. The project, which has been in the works since 2014, sees the singer collaborate once again with songwriter and producer Jim Steinman, who he last worked with on 2006’s Bat Out Of Hell III: The Monster is Loose. It will also see him sing alongside vocalists Ellen Foley and Karla DeVito. Meat Loaf previously said of the upcoming record: “It’s like nothing you’ve ever heard. It’s like Bat Out Of Hell was in ‘77 – nothing that’s out there now can compare to it. 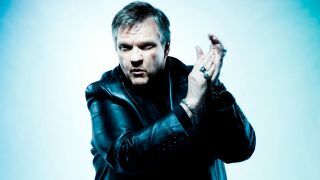 The announcement comes days after Meat Loaf collapsed onstage at his Edmonton show in Canada due to severe dehydration. His management later confirmed he is expected to make a full recovery. He has since cancelled a scheduled show in Cold Lake, with the chances of the remainder of the tour going ahead unclear. Braver Than We Are can be pre-ordered on CD or limited-edition autographed vinyl.